We spend a third of our lives asleep. That’s why buying bed sheets merits a little research. I’ve read at least six guides to buying bed sheets and all of them left me with more questions than answers. None gave specifics about how to choose high quality sheets. And savvy shoppers have wised up to the thread-count marketing game that suggests high thread count equals quality when, in fact, that’s no guarantee. So for a long time I’ve been looking for a textile industry expert who can provide specifics about bed sheet quality. Why? Well, think about it: Based on hours we spend sleeping, bed linens arguably get heavier use — but often less buying scrutiny — than clothes, towels, sofas, cars or even computers. And while fine sheets are an investment that should provide years of comfort, too many sets get pushed to the back of the linen closet because once they are washed, they don’t feel as dreamy as we’d like. The classic American, brand-name textile mills that stocked our mother’s linen closets have disappeared. As a result, there’s no linen manufacturer’s association to provide impartial consumer information in the U.S. But when I watched videos of Perfect Linens President Thomas Danaher [left] talking about sheets on his company’s new website (formerly sheets.com), I sense I had found a textile industry veteran with the technical information I’ve been seeking. I also found him outspoken about sheets and I loved his approach: “All we sell is sheets…Just sheets,” he declared in a video. Danaher agreed to speak with me and answer all my questions. I agreed to reveal to explain that Perfect Linens’ highly curated selection of sheets are pre-tested for eight different factors to ensure their quality and comfort. That means microscopic examination of the fabric as well as actual laundering to see how the sheets feel once the high-tech chemical finishing agents wash out. When asked, they provided me with photos of the labs they used. 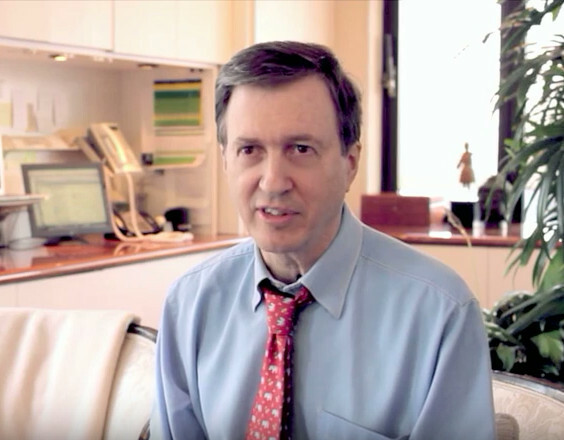 Testing supports Danaher’s approach to selling sheets based on how they feel to the buyer. It’s also “designed to find the best fabrics to market,” he says. And he feels it’s “very objective. Fabrics are sent to three different labs and the results are compiled.” The purpose, of course, is to guarantee the best quality bed linens favorable prices. During a two hour conversation, Thomas Danaher identified three key factors that affect the quality of bed linens and explained the importance of each. He gave me details on how sheets are woven, explained why the type of cotton used is important, the role thread count plays, and how to generally determine sheet quality. This information is not widely available. I’m including it here and I doubt you will read it anywhere else. What are the must-knows about construction details and how they factor into bed sheet quality? Cotton Quality. Cotton is key to 50% of bed sheet quality. Extra long-staple cotton (fibers measuring no less than 1-3/8”, according to cottonguide.org), produces the finest yarn that is also strong, thin and pliable. This yarn creates extremely smooth, thin sheets. 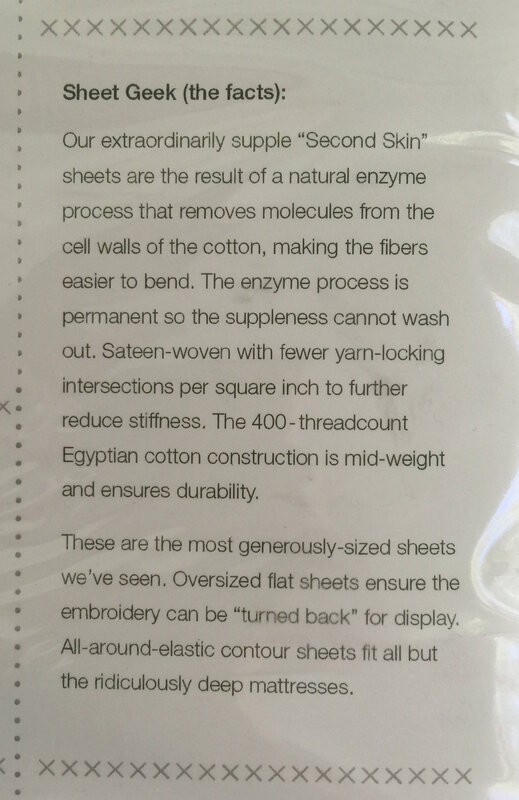 Extra long staple cottons include Egyptian varieties, Pima and trademarked Supima (U.S.-grown Pima cotton.) Cottons with shorter fiber (such as upland cotton) produce coarser, thicker yarn which in turn creates thicker sheets that also may feel less smooth, a trifle grainly, or at worst prickly. Insertions. 25% of bed linen quality depends on weaving technique. Sheets are woven with vertical (warp) and horizontal (weft) threads. Insertions refer to the number of horizontal (weft) threads added with one pass of the shuttle during weaving. The fewer insertions added with each pass of the shuttle, the smoother, more balanced and more supple the fabric will be and the higher the quality. The more insertions (12 is max) on each pass — I envision these as tiny bunches of threads — the more fabric is produced in the same weaving time but the less perfectly balanced it will be. As Danaher explained, the little bundles of yarn can shift during use. So a high number of insertions can eventually create slightly grainy sheets. This can be measured during testing. Minimum finishing. All bed linens are finished with chemicals applied to fibers, including bleach and dye. There also are “comfort finishes” mechanical and chemical processes applied to cotton fibers or to fabric. “That’s where all the games take place,” Danaher says, and it’s complicated. 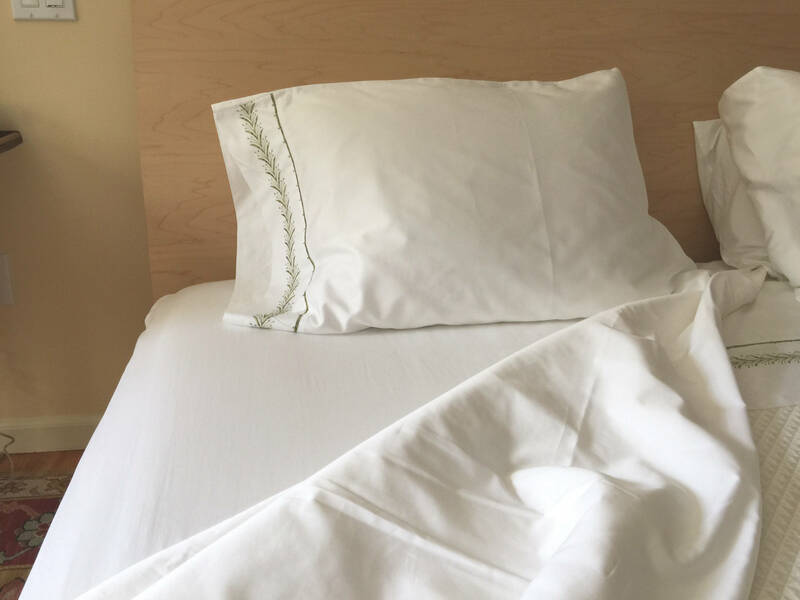 “A finishing process can make a wonderful feeling sheet,” he explains, even if the sheet is woven from shorter staple cotton with more insertions. But — and this is the big but — finishes launder out eventually, usually within a dozen washes. “That’s when the truth of the sheets come out,” Danaher says. Finishes account for about 25% of bed linen quality. Bottom line: regardless of where sheets are manufactured (brands made in any number of countries in Europe, Asia and elsewhere) the highest quality sheets are made from extra-long staple cotton, with a low number of insertions, and minimal finishing. Thread count is defined as the literal number of yarns in one square inch of fabric. However, balance is significant. And thread count is where insertion plays a role. A 300-thread count sheet manufactured with 150 warp (vertical) threads and 150 weft (horizontal) threads has excellent balance. It will be smooth and supple. However a 300-thread count sheet also can be manufactured with 100 warp (vertical) threads and 200 weft (horizontal) threads (2 insertions). Not only is the balance less desirable, that’s how and why “an 800-thread count sheet can cost less than a 300,” Danaher says. “It’s one of the tricks of the trade.” Textile mills are not obliged to disclose construction details, including the number of insertions, to consumers. These are the two best known and most popular weaving styles for bed linens. “Percale, by definition, is a single-insertion weave. And it must have 180 or more yarns per square inch,” Danaher says. 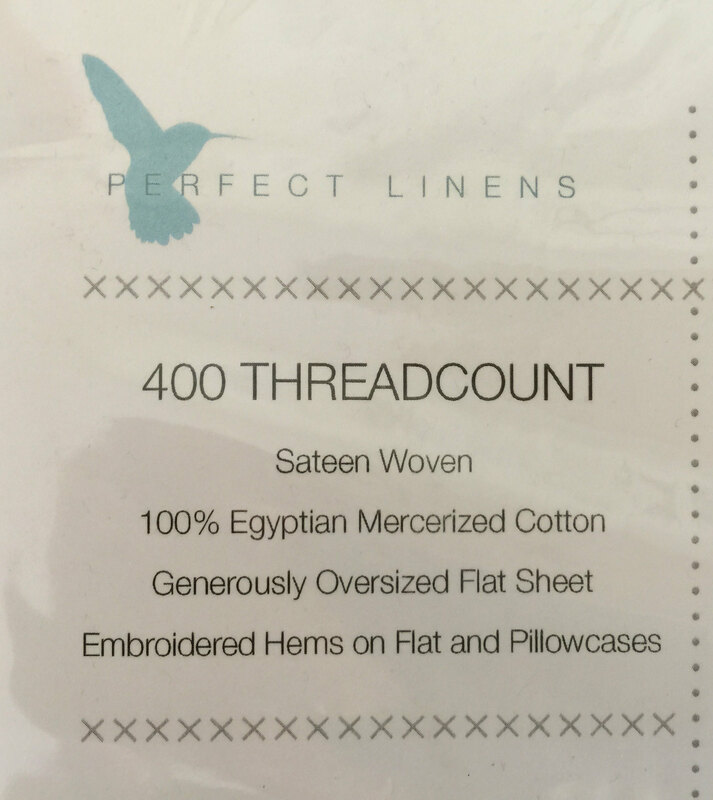 Because percale weaves are 1-over-1-under, each thread is locked down. That prevents stretching but also produces sheets and pillow cases with a crisp feel. Sateen weaves have longer warp (vertical) threads because the weave is 4-under-1-over-4 -under. 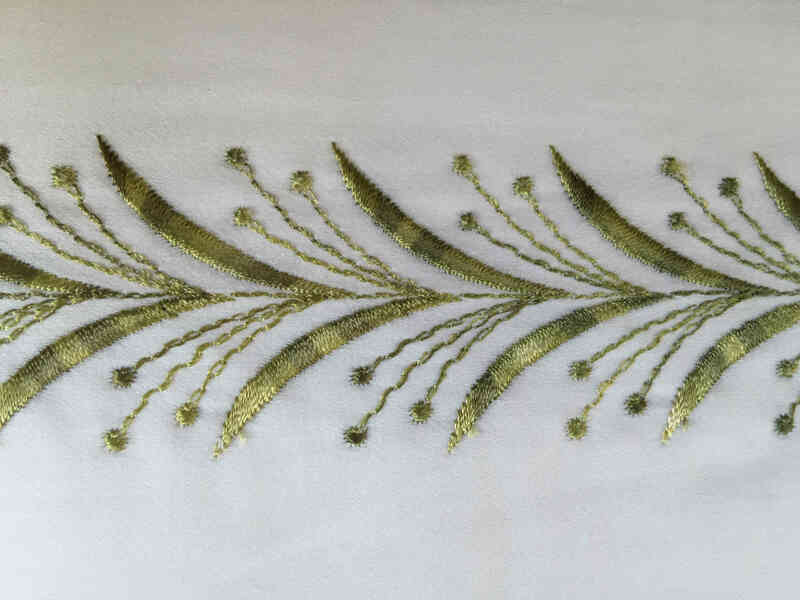 This results in a satiny sheet with a soft drape like my Fern Green sateen sheets from Perfect Linens. How do I utilize “construction detail” information when buying sheets? • I always look for detailed information about sheets, including type of cotton or fiber, type of weave, any thread or finishing details, country of origin (manufacturing). I check thread count to see if that impacts price. • Pay attention to the cotton. Because cotton is grown across the U.S. there are industry groups that provide helpful, factual information. A little reading explains a lot — especially the mystique of Egyptian cotton. Calcot, a cotton-marketing cooperative, provides historical background on cotton production in the U.S. and background on cotton species in general. Supima, a licensed trademark organization for Pima cotton products, has an informative faq and coherent cotton history. • From buying lingerie I know that “mercerized” yarn has a sheen and silky quality that can be a plus for the texture of sheets. • The weave must be specified. And it’s important to understand the characteristics of a weave before buying. Percale are my favorite sheets. They are crisp and perfectly smooth with a slippery quality when ironed and they get silkier with age. Sateen sheets are my second favorite. They remain soft and smooth over time but don’t iron as crisply. I have a few sets of textured, damask weave sheets which were expensive. But don’t recommend textured weaves as I find them woolly and uncomfortable. I only use them during the winter. • Even within the same brand, different sheet sets have different attributes. I never assume one brand of sheets will all be the same or even manufactured in the same country. I’ve generally had good luck with sheets made in Italy and Portugal. I am always wary of Chinese made textiles and tend to avoid them, though perhaps unfairly. • Ignore thread count. Paying a premium for ultra-high thread count sheets buys into thread-count marketing. Since information about insertions is not available to consumers there’s no way to be sure what thread-count really means, except by experience. • Regardless of weave, remember “all cotton wrinkles,” Danaher says. “I don’t have any problem with it. Pure cotton cannot be strictly no-iron. You have to iron if you want sheets with that paper smoothness.” However, wrinkles don’t affect the feel of sheets. 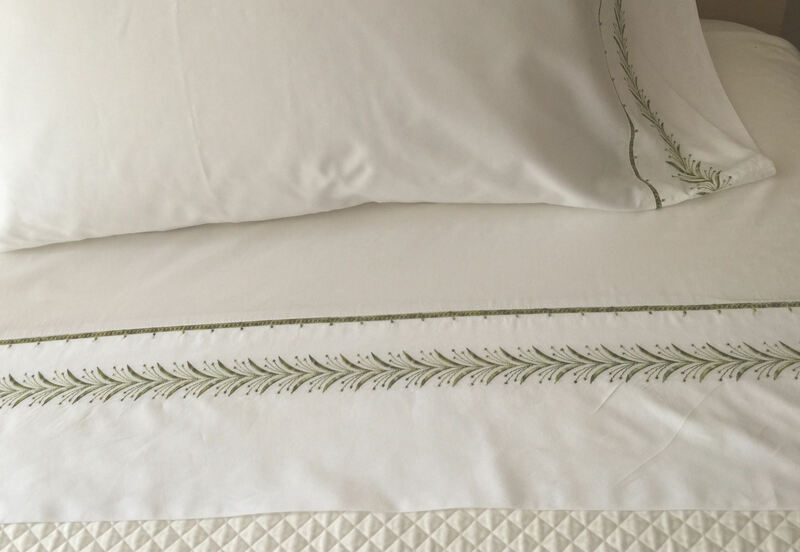 Danaher says that his own personal sheets are “hand-smoothed” on the bed — not ironed. Before buying a set (or individual sheets) I often purchase a pair of pillowcases, wash them twice in warm water and steam-iron them. That way, I can judge their texture and can use them as a test-drive. Extra pillowcases are always handy to have in the linen closet. I can understand not wanting to iron a whole set of sheets, but ironing pillowcases is fast and easy. Alternately, hand-smooth pillowcases out of the dryer and judge accordingly. For too long I washed sheets in hot (140F) water to be sure they were perfectly clean and all biologicals were removed. Then the heater in my washer failed and I was forced to wash in warm water (105F) only. The results were exactly the same so I took pity on my sheets and changed my laundry routine. Here are my new recommendations. • Do use a gentle specialized linen wash on fine sheets. Perfectlinens recommends Le Blanc linen wash. I also had good results with Vaska tabs (from drugstore.com), Woolite Everyday, and German Persil, especially for white sets. Laundry detergents and washes can vary in effectiveness depending on local water quality and whether a top load or front load washer is used. I have Le Blanc Linen Wash on hand and find it acts as a kind of conditioner for my sheets which don’t feel as dry as they do when other laundry products are used. I don’t love the original fragrance but there are newer florals available. • Do use warm water to wash sheets (unless they are stained or need hot water to sanitize). To remove stains, soak briefly in cold water with oxygen bleach or add a small amount of oxygen bleach to a cold-water prewash. • Don’t mix bed sheets with other fabrics in the same laundry load. 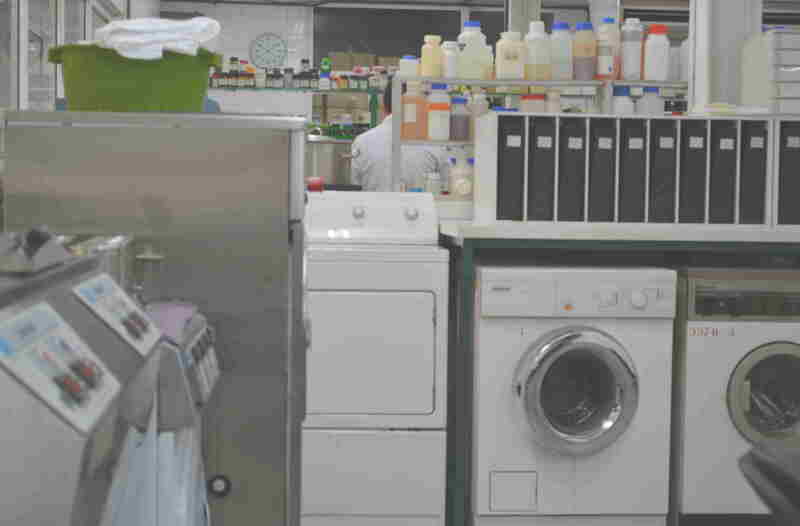 • Don’t wash with caustic commercial detergents which can roughen the cell walls of cotton fibers. • Don’t overdose laundry detergent. Use just enough for barely visible suds. • Don’t over dry sheets in the dryer. • Don’t use fabric softeners or other chemical additives. If sheets feel too scratchy without fabric softeners, it may be time to go shopping. Because we had two homes for a number of years I own many sets of bed sheets. And with access to warehouse sales in New York City, I was able to obtain the high quality linens I wanted at a reasonable cost. That is no longer possible and, after almost a decade, I’ve been seeking a new source for bed linens. 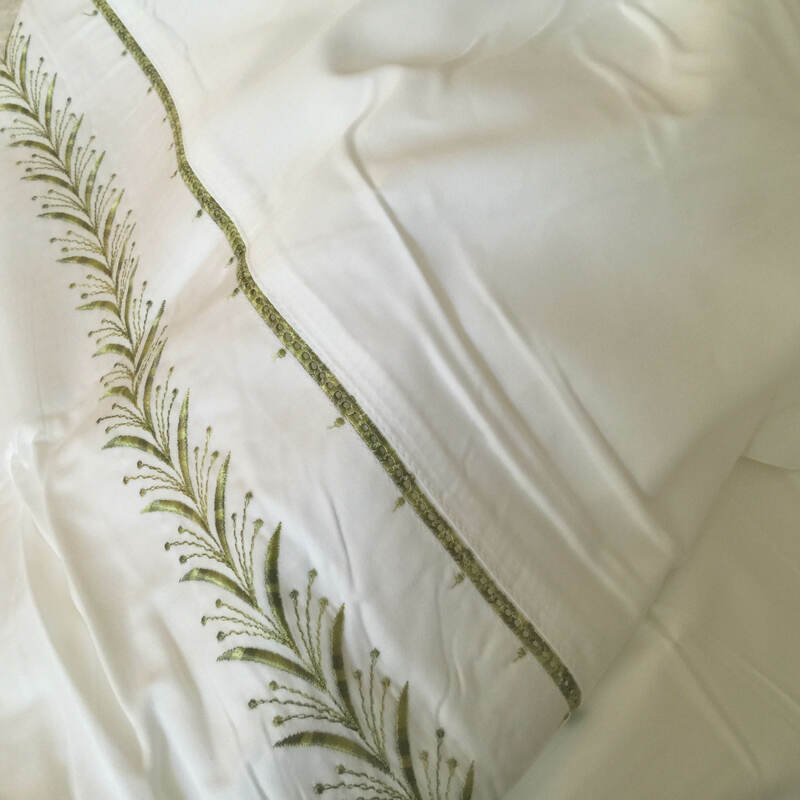 When I first opened the package of Perfect Linen’s “Second Skin” Fern Green embroidered sateen sheets [above], I was surprised at how light they felt. And the mercerized cotton gives them an almost slinky feel. 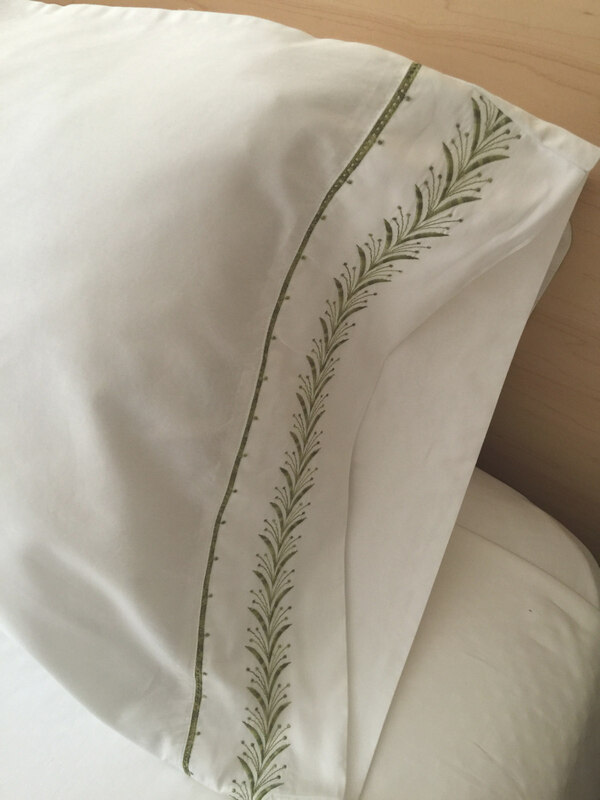 The set has lovely embroidery on the border of the top sheet and each pillowcase, complete with an embroidered hemstitch — a great detail. I also was impressed by the amount of information about the sheets given on the package insert — I’ve never seen this much before. The insert even included a hilarious section called “Sheet Geek” notes explaining the special character of this set. This told me what I was really getting with these sheets.